This year for Thanksgiving, we welcomed 24 guests over for dinner. Our tables consisted of two long tables, seating 12 at each. If you know me you are very aware of my love for Italy, so this year I went with a Tuscan theme. Colorful Italian pottery dressed the tables filled with beautiful flowers. And name cards were tied onto the napkins with a lavender accent. The table runner was laden with candles and home grown oranges from my parents backyard and everyone had a spice jar party favor full of chocolate covered almonds. On our menu, we added another turkey into the mix. This year we had two deep fried Cajun turkeys, one regular turkey, a 7-bone in prime rib, and tri-tip... and of course all the classic sides. It was definitely the best Thanksgiving yet and I’m already looking forward to the next one! We hope you and your family had an Exquisite Thanksgiving! When Youngsong Martin of Wildflower Linen called Niki about the opportunity to do a wedding in Korea, she did not hesitate. This trip was shortly after she had returned from Dubai from her speaking engagement. They reached Korea on Sunday morning and were met with the hotel driver. Paradise City, the resort where our couple had chosen to get married is only a few minutes drive from the airport and is a beautiful property. Just opened in April 2017, this luxurious resort is a mix of imagination and reality. The decor is modern accented by 'art-tainment" - a blend of art and entertainment. This place is a perfect getaway - home to seven restaurants, a bowling alley, health & wellness center, high tech casino, and more. The suite was spacious and done up beautifully. It was just about 6 am when we arrived at the hotel. After a quick shower, we ordered breakfast. We decided to go down and familiarize ourselves with all the spaces before our first meeting at 11 am. Our much deliberation we decided to hold the couple’s cocktail hour and reception in the ore function space out side the main ballroom. 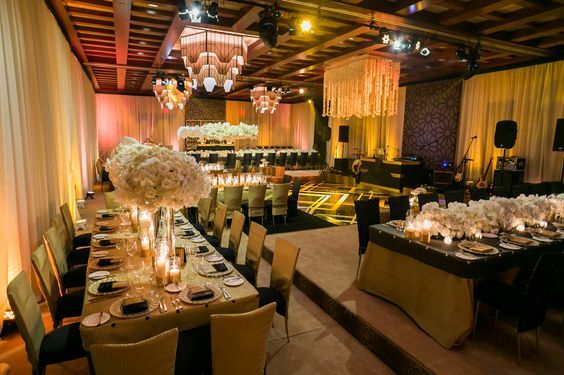 With its 30 ft high ceilings and dramatic chandeliers it was a perfect space. There was also a discussion about the after party taking place in the stunning night club at the Resort. It was a packed day with back to back meetings with everyone from the hotel that was going to be a part of this wedding as well as few outside vendors. We were then treated to a most fabulous sushi lunch at Raku located at the Resort with the executive chef and sous chef preparing the most decadent nine course meal. Our bride was able to join us by now also which made the lunch more special. 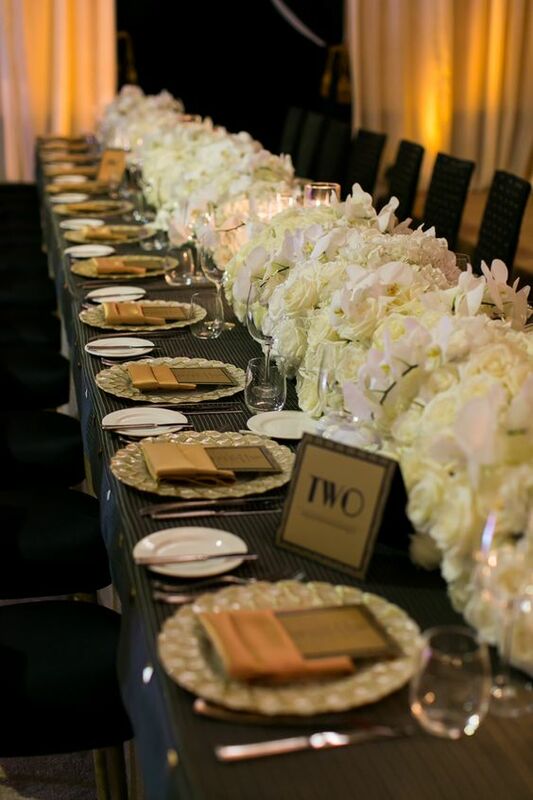 The meal was followed by a few more meetings with the chef and banquet team where the bride went through her favorite dishes she had tried earlier. Dinner was hosted by the owner/chairwoman of the Resort, a very elegant lady who is deeply involved in every aspect of the resort. This special dinner was in the private dining room of the Chinese restaurant Imperial Treasure which is decorated with a statement Bacarat chandelier and done in tones of red. The magnificent dinner lasted for a couple of hours with stimulating conversation, decadent food and amazing company. We came up to our suite at 10 pm and crashed knowing that the next day was going to be very full. We also had to check out to go to Seoul to visit the church where the ceremony was going to take place and meet some more vendors. Stay tuned for the post on Seoul! Celebrations continued on the lawn until it was time to seat the guests for dinner. The sun was just setting and the sky was getting dark. 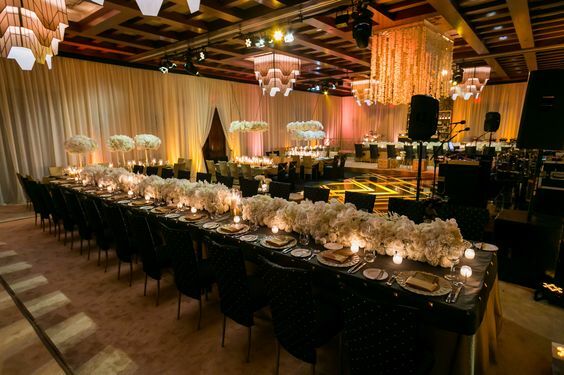 Golden candle light spread throughout the dinner space along with warm candle like glow of the ambient lighting was enough to create a magical setting. Guests entered the Terrace with lovely tunes played by the band and once seated, our good looking couple made their grand entrance from the staircase which was lined with dozens of lanterns. It was a perfect story book moment as they both looked radiant and beautiful and happy. Paris and Alex made their way to the dance floor for their first dance and everything became still. The air was filled with romance and amazing energy. 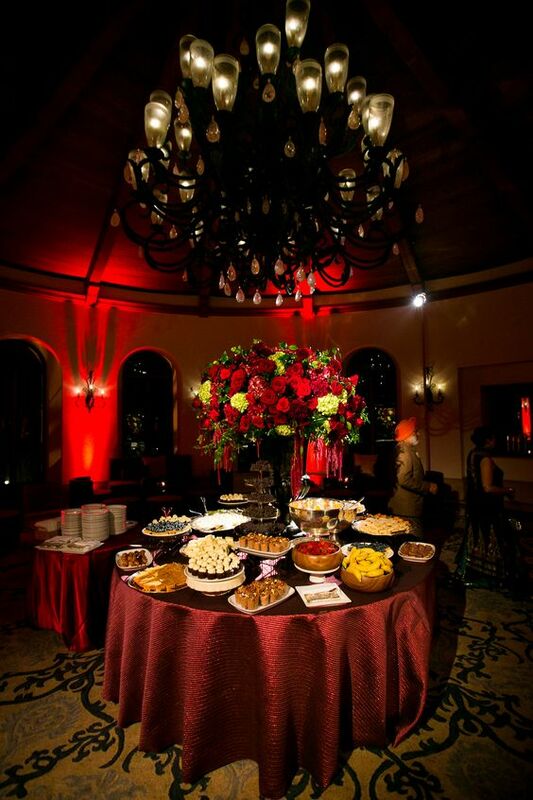 Guests could view the rotunda from the Terrace with the lit up chandeliers and the lawn in soft gold lighting. Guests enjoyed the decadent meal prepared by the chef and amidst speeches by siblings, toast by the two fathers and mother/son and father/daughter dances the dance floor was opened for all guests to partake. Our couple cut their gorgeous cake and the band made an announcement for guests to proceed upstairs for the after party. Paris wanted to carry the same colors and style for the after party. Mar Vista room had a club-vibe with amber ambient lighting accompanied by ivory and gold lounge furniture. A huge circular gold bar sat in the sun room across from the band stage and gold dance floor bearing letter “ F” in ivory to honor groom’s last name. Guests entered to the upbeat sound of music and the dance floor was full in no time. An amazing array of desserts including a variety of Lebanese desserts which were ordered by Alex’s Mom awaited to be consumed. Late night snacks were served close to midnight and this memorable and enchanting evening came to an end. The best part for us was to of course plan this wedding but in the end form that amazing bond with the couple and their families. We will always cherish this relationship and wish our lovely couple Paris and Alex life time of happiness. 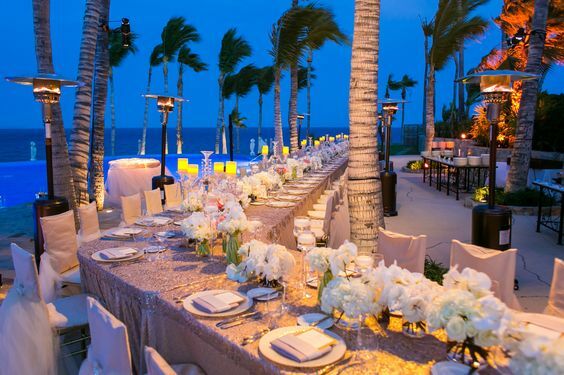 One of the most dreamt about wedding location is The Resort at Pelican Hill and not only because of its breathtaking views of the Pacific Ocean, but it is truly the definition of luxury and elegance. Just tucked off the coast of Newport Beach, with the peaceful setting of olive trees, lavender and the iconic rotunda this is one of most sought after locations to wed. And this is where Paris and Alex decided on for their nuptials and reception. After the initial design walk through it was decided that the Rotunda Lawn would be used for ceremony and cocktail hour for their 300 guests. Paris had a very clear vision about the design and colors for her event and wanted something very European and to exude understated elegance. 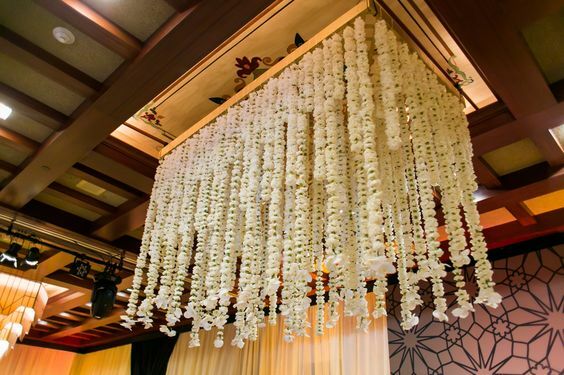 With much deliberation, she decided to go with ivory chiffon fabric to cover the columns of the imposing Rotunda structure and keep the cream, white and ivory for her flower palette. Three beautiful crystal chandeliers in different sizes and shapes embellished the inside of Rotunda while two large urns with gorgeous flowers graced the outside of Rotunda. Flowers lined the aisle for our lovely bride to walk down. Chivari chairs dressed in ivory chiffon was another testament to Paris’s timeless classic taste. An eight piece string orchestra was ready to start as guests arrived. The other half of the lawn decor was a perfect compliment to the ceremony area with ivory lounge furniture in Classic French Regency style and the cocktail tables dressed with the same chiffon linen as the chairs completed the cohesive look. 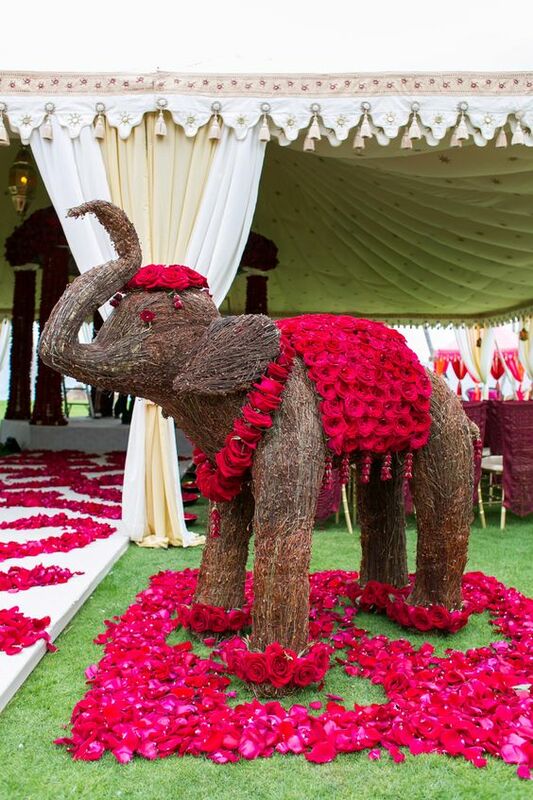 The end result was ethereal, romantic and elegant. The two mothers looked fabulous in their gowns along with the entire bridal party. Our radiant bride walked down the aisle in her Vera Wang gown with her Dad to meet her handsome groom in Ralph Lauren. While the string music was playing. Weather could not have been more perfect with sun not being intense, clear ocean view and slight breeze, it was a magical set up. 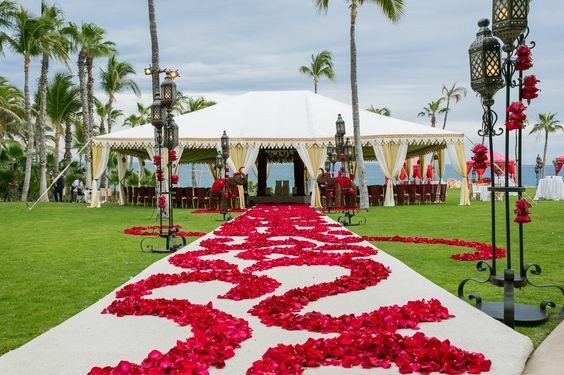 Bishop performed the beautiful ceremony and the air was filled with romance and magic. Once the bridal party and couple walked at the recessional it was all about cheers, joy and laughter. Guests transitioned to the cocktail area where servers were ready to pass champagne and delicious hors deouvers. The bars were open on both sides which became busy quickly. A table was dedicated for the guest book where guests could write warm wishes for the couple. 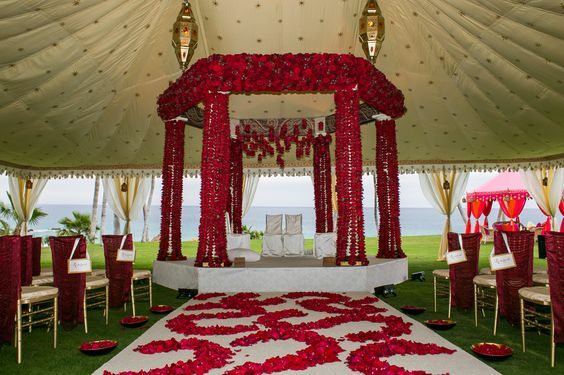 A large mirror bearing seating chart for the guests further added to the ambiance. With lovely music, delicious food and drinks, amazing setting and most importantly our good looking couple and their families and friends, it certainly was a night to remember. Stay tuned for our reception and after party next week!